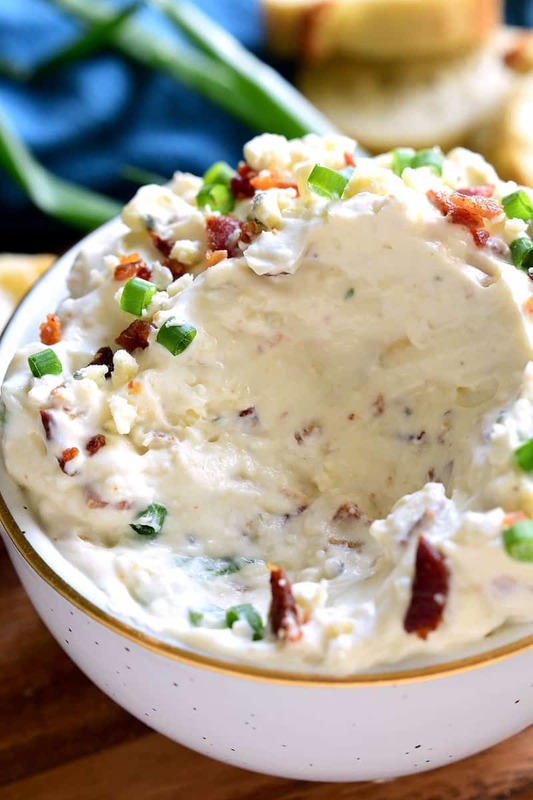 This Bacon Blue Cheese Dip is the ultimate easy party dip! 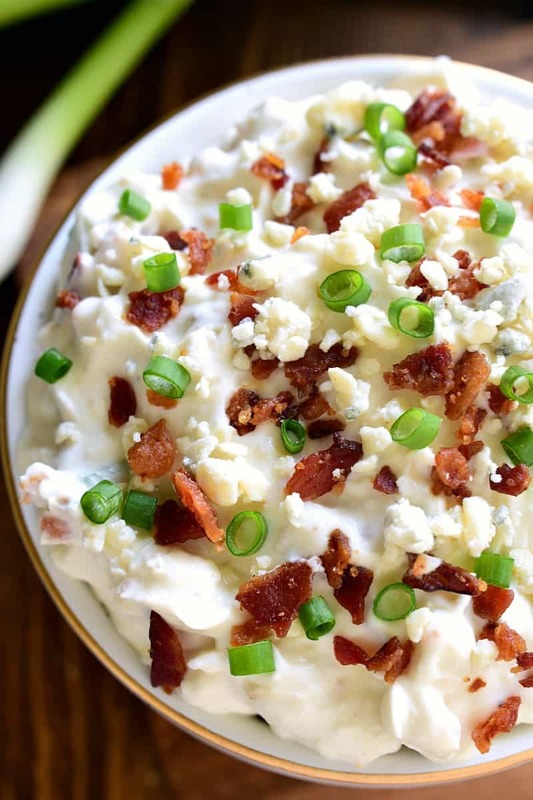 Loaded with the delicious flavors of bacon and blue cheese, this dip is creamy, flavorful, and perfect for easy entertaining! So have I told you that Ellia is already asking when football starts again? I swear…sometimes I think she lives for it, which is so funny to me. Because I’m the exact opposite! Not that I don’t love football season for the parties and football food (I’d be crazy not to)…but it’s no surprise that the actual game means very little to me. Ellia, though? She LOVES football! Not only does she love watching and asking questions and coming up with different scenarios about how the game will turn out…but I really think she loves the family time. And especially the dad time. Because if there are two people in our family who are definitely watching every game, it’s Ellia and her dad. Well, unfortunately for Ellia, we’re still a ways away from football season. But. What she doesn’t know is that March Madness starts TODAY! And even though it’s not the same as football, you could definitely argue that it’s just as fun. Or maybe even more fun! Because there are so many games in such a short time. And the games are fast paced and exciting. And, well, because her dad will be watching them. Which counts for a lot! We’re already planning to watch tonight, and tomorrow night, and probably most of the weekend. And we’re already thinking about what we’ll be eating! Tonight it’s wings for Jorden and sushi for me (ha!) 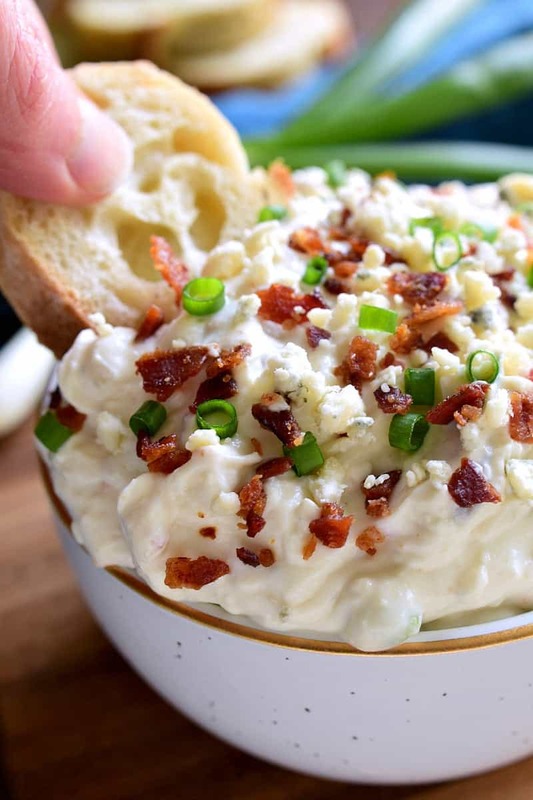 but you better believe this Bacon Blue Cheese Dip is on the menu for the weekend. Not only is it packed with the BEST flavors (you really can’t go wrong with bacon + blue cheese) but it’s so easy to make! 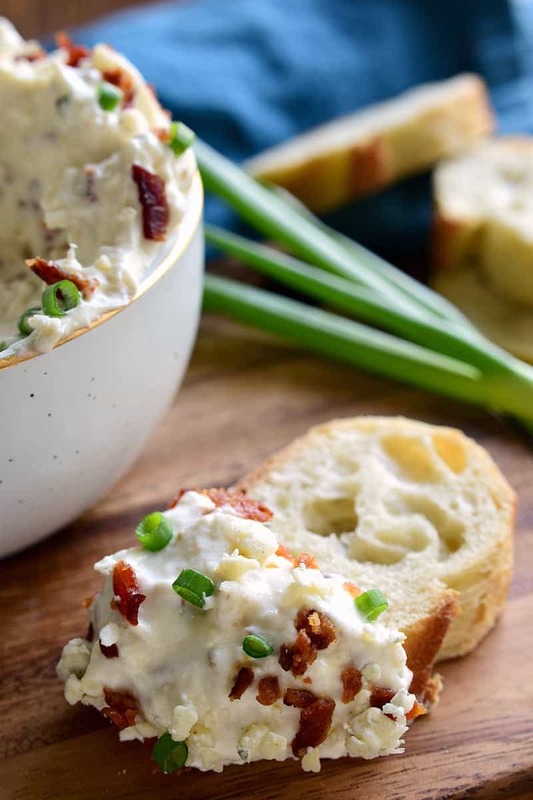 All you need is 6 ingredients and 5 minutes….and you have yourself a creamy, flavorful Bacon Blue Cheese Dip that everyone is sure to love! And…if your family doesn’t love blue cheese? Feel free to replace it with your favorite kind! So. Do you plan to partake in March Madness? If so, I’d love to know what you’re eating! And either way, this Bacon Blue Cheese Dip is an easy way to add some deliciousness to your weekend. Or….save the recipe for your next party! 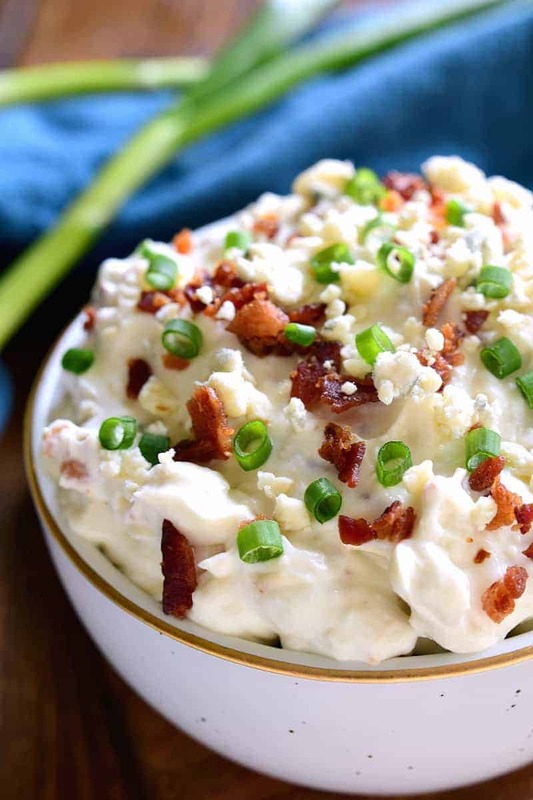 Because this Bacon Blue Cheese Dip is guaranteed to be a BIG hit! Check out these recipes for more great dip ideas! 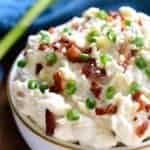 Is the ranch dressing that you’re using in this recipe and “dry” ranch dressing or the actual salad dressing? This dip sounds delicious! Thanks! You crazy. How you get dry dressing? Is that like Astronaut ice cream? Crazy…like off da chain crazy. We do a lot of “snacky” dinners and my boys are ranch obsessed! Seems like a win-win for us. Two of my very favorite flavors together! Can’t wait to dig into this dip! This is totally my kind of dip!! Blue cheese and bacon dip is my kind of party food. Is it 2 Tablespoons of ranch dressing or 2 Tablespoons of dry ranch seasoning packet?